Established in 1888, The Saratoga Sun is published weekly covering the news and advertising that affects the Platte Valley, which includes Saratoga, Encampment, Riverside and Ryan Park. We can be contacted at 116 E. Bridge St., PO Box 489, Saratoga, WY 82331. Phone 307-326-8311. Fax 307-326-5108. Email: saratogasun@union-tel.com or sunads@union-tel.com. 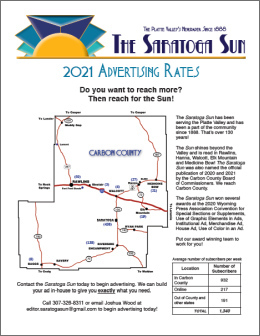 To advertise, please contact: Keith McLendon, General Manager, at 307-326-8311 or saratogasun@union-tel.com.